The e-commerce supply chain is in transition, and certainly not the way we all envisioned how the e-commerce market would evolve over time. The customer has demands today that have challenged the most iconic brands on how to deliver on their promise in a market that is quickly becoming hyper-local. Most retailers’ nemesis, Amazon, is constantly raising the bar on the customer experience. We need to go back to the drawing board to understand how to develop a supply chain solution that will allow retailers to compete in this ever-changing market. Travel back to the year 1995. Amazon launched its new online book store and by the end of 1996, it had generated $15.7 million in sales supported by two fulfillment centers in Seattle and Delaware. There were only 16 million online users; the majority of the U.S. population was oblivious to the existence of the internet as a place to shop. Buying things online was all about price, selection and a secure process through checkout. The big sellers were “hard goods,” those things you didn’t have to touch, feel or smell in order to buy, such as books, computers and other electronics. Fulfillment solutions typically consisted of one fulfillment center node centralized in the U.S., providing delivery to the end-consumer in greater than five days on average, and the customer was OK with this service level. Fast forward to today and how times have changed! In 2016 there were over 211 million online shoppers in the U.S. As published by eMarketer, etail e-commerce sales in North America rose 15.6% in 2016 to reach $423.34 billion, maintaining the U.S.’s status as the world’s second largest regional e-commerce market. The top categories in shopping last year included apparel, baby products, furniture and home décor. We went from single-channel, to multi-channel, to omnichannel, and now unified commerce, where the goal is to put the customer experience first. Retailers are transforming their organizations to align all processes and technology to provide a single, centralized real-time platform for all customer engagement points to include in-store, point of sale (POS), mobile, Web, customer care and clienteling. However, only about 18% of brands have this capability today. The brand that was launched in 1995, Amazon — which almost had to file for bankruptcy in 2000 — has become the driving force behind the transformation of this industry. An analysis by Slice Intelligence released in February found that 43% of all online retail sales in the U.S. went through Amazon in 2016. They have created the new customer that expects a fast, free and convenient shopping experience. They provide this through 140 fulfillment centers, setting a new bar for order delivery in two days through their very successful Prime product. A study released in September by Consumer Intelligence Research Partners found that 20% of all U.S. consumers are Prime members. In addition to these centers, Amazon has launched 25 regional sortation centers and deployed 40 cargo jets and thousands of tractor trailers, giving them control over the outbound transportation of their packages within their network — all to get closer to their customers. The newest addition to their network will be a $30 million, 362,000-square-foot “sortation center” in Mobile, AL scheduled to open later this year. To keep up with Amazon, the supply chain model today is evolving to a regional distribution strategy. Instead of one centralized center, retailers are utilizing smaller regional centers to locate products closer to their customers. 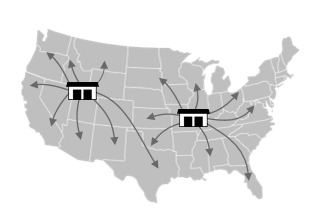 This typically is a two-node network with an east and west coast location; few retailers can invest in more than two centers. To help retailers reduce fixed cost and to broaden their reach to their customers, retailers have partnered with 3PLs to help them gain a shipping advantage. Retailers are also rethinking the use of their stores as not just a selling engine, but as a fulfillment and returns center to reach the customer quickly and to provide the convenience that the new customer is demanding. As an example, about 25% of Target Corp.’s 1,800 stores nationwide ship online orders to customers, handling over 20% of the retailer’s total e-commerce sales last year and 50% of online electronics orders in Q4. As e-commerce has evolved, it is still as complicated as it was in 1995, but with new challenges. Many retailers are only now implementing a regional supply chain strategy, and even fewer are utilizing stores for fulfillment. So what does the future of the supply chain look like? How do retailers get ahead of the curve? If you follow Amazon, you know where the future is heading. In addition to their current network, Amazon has almost a dozen new centers slated to open this year. Their continued strategy will result in FASTER delivery for their customers — two-hour delivery instead of waiting two days or more. Their next goal is 30-minute delivery, which is now threatening even the convenience provided by the brick and mortar physical stores. With their own transportation fleet in development, Amazon will now be meeting consumers at their door. Local shoppers can receive some items on Sundays and over the holidays, with two-hour delivery on Christmas Eve to customers in 30 metro areas nationwide. One can only imagine how the Whole Foods acquisition will be leveraged for their broader e-commerce business. They now have a localized footprint in some of the most affluent neighborhoods in America. The new fulfillment network strategy going forward will be metro logistics — smaller fulfillment centers located in metropolitan cities to reach the customers within a day, and even within hours. 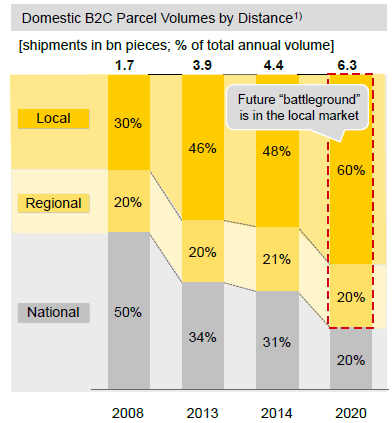 By 2020, over 60% of parcel deliveries will occur within a local fulfillment center ne twork. Now more than ever, retailers will need to partner with 3PLs. 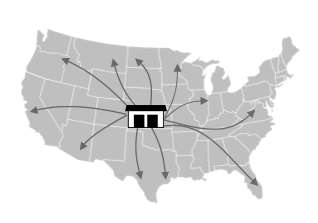 Some retailers will use 3PLs for their entire fulfillment network to take advantage of the 3PLs’ technology investments and expertise, while others will augment their larger in-house fulfillment centers with metro-located fulfillment centers managed by a 3PL partner to provide their customers with enhanced delivery methods. The shipping solution will look to carriers outside of the big players, who will lose share of the market and no longer be the only players in town. New revenue streams will need to be accessed. Going global will be more important than ever before. For example, China offers U.S.-based brands tremendous opportunities for e-commerce growth. The Chinese e-commerce market growth rate increased by 26.2% last year — over 10% higher than the U.S.’s. Chinese consumers love premium items and often shop online to order imported goods, as the trend shows that they perceive foreign goods to be of higher quality. As a consequence of this new interest, Alibaba’s Tmall Global, which specializes in premium imported goods, more than doubled its sales in 2016. It has been a fast and furious 20 years, and nobody knows what the next 20 years will look like. Challenges today will be simplified by tomorrow, and bigger and more complex challenges will arise. Keeping an open mind to these new challenges will be important, and acting on the challenges today is critical to surviving in this competitive environment. Amazon will continue to innovate and push retailers to deliver a heightened customer experience. Will the supply chain include drones? Of course! Will this innovation provide the customer experience that will set the new bar? Debatable. What we do know is that a successful supply chain going forward will involve retailers developing strong partnerships with providers to help spread the risk. 3PLs, retailers and specialized technology providers will build a tighter bond to survive in this new world — one full of possibilities and growth. Don’t get stuck in your fulfillment strategy. Dedicated centers are out of date; regional centers need to become part of your strategy quickly, followed by metro logistics. Supply chain strategy needs to be dynamic to keep up with customer expectations. It will not be easy; however, there are many proven partners to help you build your new e-commerce supply chain strategy. DHL’s VP of Strategy and Product Management, Craig Morris, made the following comment about delivering in a localized world: “Be open minded. Try and fail faster.” His sentiment is echoed here. DHL eCommerce is here to solve your fulfillment needs! For more information on our fulfillment services, visit our website or give us a call at 1-800-805-9306.